An old high school acquaintance circulated an image of American soldiers carrying a wounded soldier on a stretcher through a war zone. 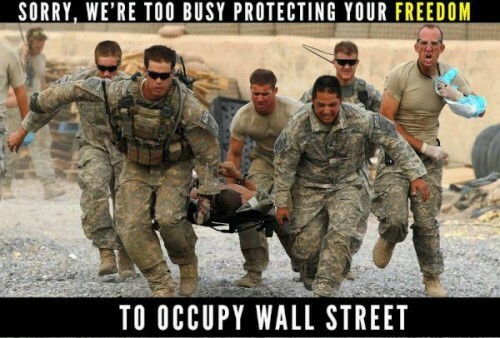 The text surrounding the image reads: "Sorry, we're too busy protecting your freedom to occupy Wall Street." This image has circumnavigated the Internet, as such things tend to do. It usually is met with responses such as: "The OWS movement is filled with a bunch of lazy, spoiled, far-left, frauds," or "'Nuff said." We all love these Internet-ready mini-billboards which attempt to drive home a point with an economy of words and a searing image. They can be powerful and persuasive. But this one rankled me. To be clear, I have nothing but respect and admiration for our men and women in uniform, and for our veterans, but, one could insert any movement, cause, or daily activity in the last part of this text: 'attend your tea party,' 'walk for breast cancer,' 'vote democratic.' Sadly, we have to go about our lives here and do what we need to do, whether that's attending a football game, leading a scout troop, or exercising our right to protest. Undoubtedly, many of these soldiers would rather be here occupying Wall Street, like many other fine service men and women. "For 10 years, we have been fighting wars that have enriched the wealthiest 1 percent, decimated our economy and left our nation with a generation of traumatized and wounded veterans that will require care for years to come," said Joseph Carter, a 27-year-old former Army sergeant and Iraq war veteran who marched Wednesday to Zuccotti Park. This article is garbage. To defend these "occupiers" is wrong. "undoubtedly these soldiers would rather be at OWS"? Are you effin kidding me? not garbage, you missed the point. I will simplify, the image above is an annoying blanket opinion assuming to reflect the views of the entire military, when in reality there is no one opinion of military personnel, just like in the rest of America. apparently you haven't read the quoted story on Military.com or countless others like http://www.usatoday.com/news/nation/story/2011-11-01/occupy-wall-street-veterans/51031852/1 . maybe google "marines at OWS" too. no, are you effin kidding me? How do you find an ignorant, media controlled drone while discussing occupy? Don't worry, they'll make it clear all by themselves. One of our freedoms which is being protected by our troops is our First Amendment right "of the people peaceably to assemble, and to petition the Government for a redress of grievances". This poster seems to be suggesting that our troops should protect our constitutional freedoms, but then it is somehow wrong for citizens to exercise those freedoms??? To suggest, "Undoubtedly, many of these soldiers would rather be here occupying Wall Street, like many other fine service men and women." For the most part, the 'OWS" bunch are not seen as valient citizens exercising their constitutional rights but rather as a bunch of slackers who want something for nothing. 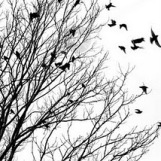 What rankles me in turn are those who find *one* opinion (or action) and presume it to represent a majority. Nations’ militaries are big organisations and the opinion or behaviour of one, ten, or even a thousand, does not come close to representing the majority. ‘Undoubtedly, many of these soldiers would rather be here occupying Wall Street’--cack. As someone ex-military, I would bet serious money that, if consulted, the vast majority of the military, serving and former, *despise* the Occupy Wall Street crowd. ‘This poster seems to be suggesting that our troops should protect our constitutional freedoms, but then it is somehow wrong for citizens to exercise those freedoms?? ?’ And you, my excessively punctuating friend, seem to be suggesting that certain opinions should be immune from criticism. Is the person who made the image demanding the protests be suppressed? No. Are the troops demanding the protests be suppressed? No. Freedom means not just the freedom to protest, but also the freedom to criticise those protests. So you carry on protesting; and I will carry on despising your insufferably smug bourgeois liberalism. The article suggests the picture was taken in Iraq. In fact it was taken in Afghanistan, where arguably our military is indeed protecting our freedom, or at least our lives. Afghanistan was after all the home of SBL and Al Qaeda when the attacks of 9/11 occurred. As well it's pretty safe to say that at least some of the soldiers in that photo support the caption. They have the photo without the caption but choose to post it to their facebook pages with the caption. The soldier second from the right in sunglasses is a personal friend and the pic appears with caption on his FB page. SBL in my previous post was supposed to be OBL. Osama Bin Laden.